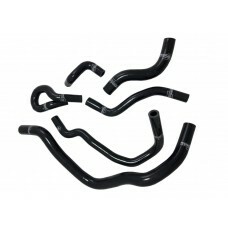 Often after a short time (and especially at advanced car age) the stock hoses contract under vaccuum conditions and expand under overpressure conditions. This situation makes the car lack in performance. Also when it comes to cooling water, the hoses get hard and leaky. BOOST products silicone hoses are made of silicone with triple to quaduple textile layers for highest stability and durability. They are cooling water resistant, temperature-resistand up to 220°C and pressure resistant up to 4bar.